Passengers board a Delta Airlines flight. In 2014 I first wrote here about the issue of incredibly shrinking aircraft accommodations with “Think airline seats have gotten smaller? They have.” Using archived data, I detailed how both legroom (as measured in seat pitch) and comfort (as measured in seat width) have both been steadily decreasing since the 1980s. In the four years since that column was widely disseminated, conditions have only gotten worse. Therefore the recent headlines declaring that Congress had addressed airborne seat shrinkage seemed like welcome news. But the underlying issues are much more complex. And it’s way too soon to celebrate more legroom in an industry that is actively squeezing us into increasingly cramped quarters. Tighter seats eventually caught the attention of one group of frequent flyers poised to do something about it: members of Congress. Thus H.R. 1467, the Safe Egress in Air Travel (SEAT) Act, began making its way through the legislature two years ago. Eventually it generated support from both parties and in both houses of Congress, and last month it was included in the Federal Aviation Administration Reauthorization Act signed by President Trump. When the bill became law, Rep. Steve Cohen (D-Tenn.), a co-sponsor, declared victory by stating, “Safety must never take a backseat, much less a shrunken seat, to profits.” Numerous articles have been written suggesting the FAA will now clamp down on airlines cramming more seats into cabins. The comfort issue is obvious for anyone who has flown in economy class in recent years, particularly in middle seats. But tight seats also are a health issue due to the threat of clotting and deep vein thrombosis. And of course there’s a safety consideration, since packed seating can make emergency egress more difficult. Among U.S. airlines, differences still remain in economy-class seating standards. JetBlue, for example, offers 34-inch pitch in coach on its Airbus A320, and that’s without having to pay for “Even More Space” seats. On the other end of the “ouch scale,” critics have long pointed to Spirit Airlines, the ultra low-cost carrier offering a knee-busting pitch of just 28 inches. But other domestic airlines aren’t much better these days. In fact, Spirit’s seat width of 17.75 inches actually measures up well against the Big Three of American, Delta and United. Last month, in asking “Is Amtrak becoming like the airlines?” I noted the economy/coach sections of the Big Three had shrunk to just 30 to 31 inches in seat pitch, and 16.6 to 17.8 inches in width on Boeing 737s, workhorses for domestic service. This compares with 1985, when Consumer Reports found the tightest pitch on some airplanes in domestic service was 32 to 34 inches, and most aircraft offered much more legroom. That Congressional hearing I referenced above took place on May 2, 2017; the very next day, headlines blared that American (and possibly United) was considering reducing legroom by up to 2 inches in the economy sections of its Boeing 737 MAX jets, creating pitch of just 30 inches, and even 29 inches in some seats. That news indeed came to pass, at least partially: According to both American and SeatGuru, the airline’s 737 MAX currently offers 30 inches in Main Cabin economy class. And the expansion of domestic basic economy classes, which recently spread from the Big Three to JetBlue and Alaska, means domestic airlines are certainly not eager to increase seat comfort on their own – despite the negative implications for comfort, health and safety. Back in March I addressed this critical safety issue with “Is it time to update airplane evacuation tests?” I pointed out the FAA’s “90-second rule” for evacuating commercial aircraft has been in place since 1967, but hasn’t been updated in 51 years in response to an array of factors, including the introduction of widebody, twin-aisle airplanes; record-high passenger loads; record numbers of carry-on bags due to ubiquitous checked baggage fees; and average Americans becoming both taller and heavier. And of course, tighter airplane seats. So far these arguments haven’t swayed the government agency charged with protecting flyers. In July, Bart Jansen noted here that an FAA official stated there is “no evidence” seat dimensions “hamper the speed of passenger evacuation, or that increasing passenger size creates an evacuation issue.” This isn’t heartening news for consumers, particularly since in December 2017 this same U.S. Department of Transportation – which oversees the FAA – shut down without prior notice all public comments on a series of consumer issues the airline industry had criticized. So it’s a two-front war for advocates concerned about the safety issue: convincing the FAA to re-evaluate existing seat standards, and not to allow even further seat shrinkage. What follows are some key reminders for passengers concerned about the seats they book. • There’s no shortage of sites offering advice on how to secure the best airline seats for those concerned about tight quarters. But note that policies vary widely by airline. • Unassigned seating. On airlines with unassigned “open” seating – such as Southwest – the key is to prioritize your boarding; if you don’t automatically qualify for early boarding (frequent-flyer elites, handicapped, families with children, military, etc.) then options include purchasing upgraded boarding. Checking in early – up to 24 hours in advance – will help, but isn’t a guarantee for prioritized boarding. • Assigned seating. With most airlines, the best strategy for securing seats is to book early and select in advance. But remember that some airlines may not show all available seats during booking in an attempt to “upsell” you to premium seats at a higher cost. For those not in premium classes or ineligible for priority boarding, booking early and checking in early are key. But beware you may be forced to pay more, since many booking systems are now designed this way. • Many airlines provide seat pitch and width dimensions on their websites; some also include seat maps and info on Wi-Fi, entertainment, amenities, etc. These include American, Delta and United. • For comparison purposes, check out the seat maps section on SeatGuru. The site provides detailed data that many airlines don’t, including locations of lavatories, galleys and exits. • An important reminder: Within a given aircraft model, such as the Boeing 737, there can be numerous series, variants, types and sub-types. For example, SeatGuru provides six different seat maps for Delta’s Boeing 757s and six for Delta’s Boeing 767s. Pay particular attention to variant numbers (e.g., 757-200 vs. 757-300) and designations such as “-ER,” which indicate aircraft primarily used for extended range overwater and long-haul flights, often with different seating configurations. Some differences might seem subtle, but they can be significant if they affect your specific row or seat. Congress made it clear the FAA needs to set and enforce more sensible seating standards. The coming months will determine if that mandate will be heeded. This article originally appeared on USA TODAY: Airline seat size: Will FAA bring relief to squeezed flyers? 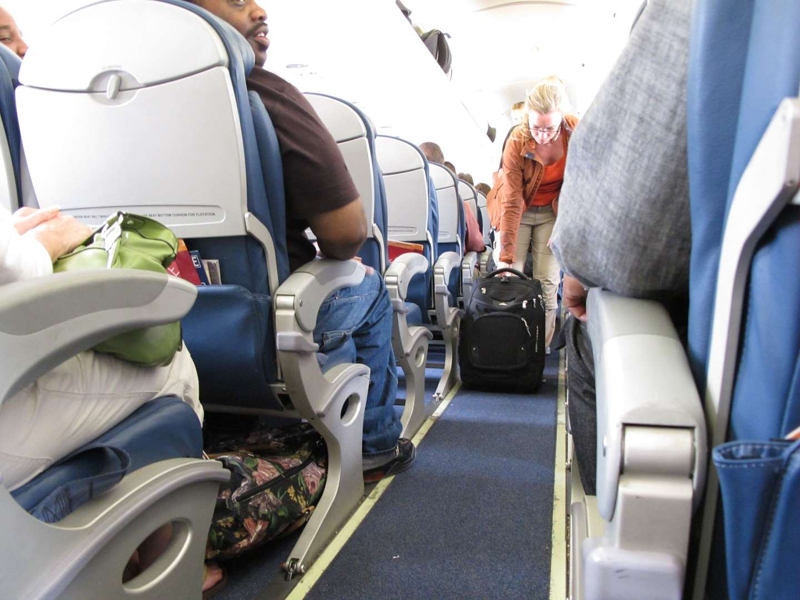 Travel - U.S. Daily News: Airline seat size: Will FAA bring relief to squeezed flyers?